Home » WOD Blog » Nothing like the first time. Nothing like the first time. Notes: We want as many people to try getting on the high rings as possible! If you are proficient at muscle-ups, try a harder/different variation (strict, non-false grip, bar, etc). If you are just learning the movement, focus on learning the transition. Notes: This is 16 total alternating rounds of 20 seconds of work followed by 10 seconds of rest. The dips can be performed with a band, on straight bars or push-ups can be substituted. The other day I was reflecting on how exciting it felt to be a “newbie” to crossfit. Everything was completely new and foreign, my lack of skill felt overwhelming, and I would show up a ball of nerves filled with anticipation, dread, fear and determination to do well. Such a magical time! We tell people it doesn’t get easier, you only get better. Things like PR’s become hard fought rather than weekly occurrences and shaving minutes off benchmark workouts is replaced by seconds. The wonderful thing about what this picture represents is that even after your “newness” dims, your “first times” and PR’s will continue. PR’s while incredibly satisfying don’t hold up forever. They keep us hungry for more and remind us there is always more work to be done. It’s true that you never forget your first, and it’s interesting to me that I don’t remember the PR’s the way I remember certain “firsts”. 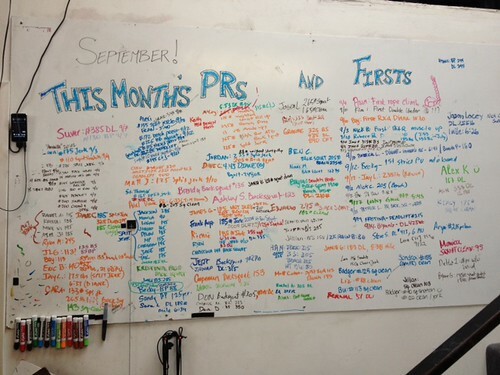 My first crossfit class, my first muscle-up and my first competition are all things I can recall with amazing detail! Feel free to take a trip down memory lane and post your favorite “firsts” to comments.